Yes, we have a new example of Vin Scully showing why he's the best. The stadium announcer, by the way, opened the day by informing the crowd that there had been a plane crash that morning at SFO, and she asked for a moment of silence. She got it, after people stopped gasping. Many did now know of the breaking news just a few miles away (this was a 4:15 game.) During introductions of the rival Dodgers' lineup, the booing stopped at Yasiel Puig's name for a few seconds of murmuring. It felt like a mix of curiosity and respect, though of course the fans loved it later when the Giants' ace pitcher Madison Bumgarner struck out the rookie three times and made him look like an over-swinging kid each time. During the first inning, the Giants' popular catcher Buster Posey came up third and stroked an RBI double to left. After Pablo Sandoval followed him, Dodgers manager Don Mattingly emerged onto the field and showed the home plate umpire his lineup card. Busted: the Giants manager, Bruce Bochy, had written in that Sandoval was supposed to hit third, then Posey fourth. The umpires caucused and called Sandoval out, reset the score to 0-0, and sent Posey back up to hit again — this time as the official fourth batter of the inning. Posey flied out this time. End of inning. The beauty of baseball. They never really explained the snafu to the stadium crowd, though it could only have been a batting out of order violation. On Twitter, I saw that LA Observed contributor Bob Timmermann quickly posted it was the first batting out of order event in the major leagues since June 19, 2010. Jon Weisman of the Dodger Thoughts blog added it was the first involving the Dodgers since 1994. I suspect that Jon Miller explained it well for the Giants fans on radio, and that Vin Scully more than covered it for Dodgers fans. OK, so here's the real reason for this post. The following day, during Sunday's game, Scully revisited the incident. While telling that story, he inserted a story from his first season with the Dodgers in 1950, and he narrated the present game. I didn't hear it, but I think it's probably better as written literature. The transcript is posted without comment at Sons of Steve Garvey, because no comment is really needed. Read it there, but here's how Scully begins. Too bad that Roderick had to watch Saturday's game rather than either Dodgers-win bookend. He really should make sure to visit AT&T Park for a Dodgers victory. It's a great experience. Kinda fucked up to take a picture of someone, post it on a blog, and make fun of their weight. 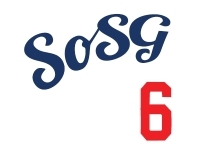 Even though you can't identify her it's a little too lowbrow even for the SOSG. Thanks, I'm not usually uptight about that stuff, but I just felt bad for the girl... and I rarely feel bad for Giants fans. Would've been different if she was flaunting her figure. In all seriousness, I'm glad you brought it up on a comment. I had that little tinge of a feeling when i originally captioned it, figured it was borderline, and opted to go with it...but your comment helped me think it through. Thanks EP. 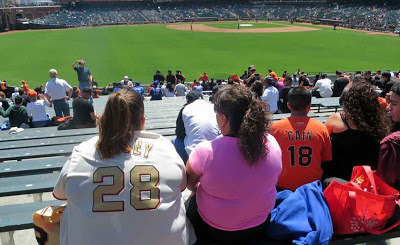 I don't know which AT&T Park this guy went to, but it wasn't the one I've had to suffer through on numerous occasions. The one I've been to is cramped, has lousy sightlines if you're not behind the plate, and is a nightmare to get out of. (In all seriousness, I hope there's never any kind of disaster there, because hundreds will be trampled.) 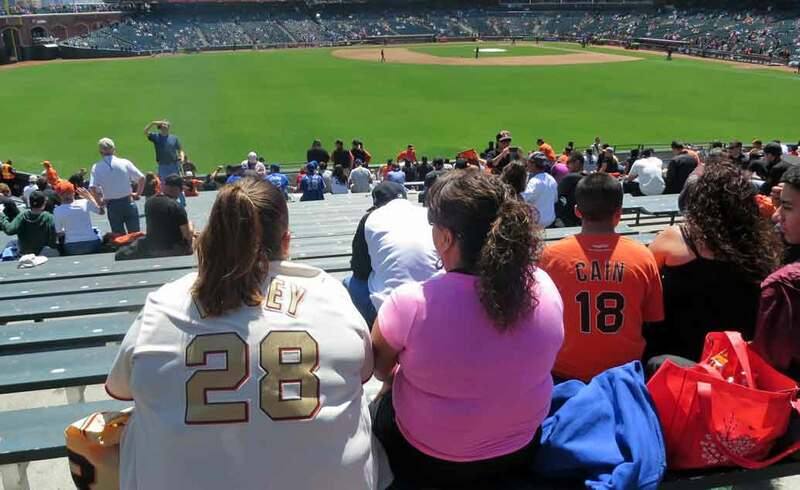 The food choices are mediocre, the beer absolutely undistinguished, and the overall ambience -- thousands of drunken Giants fans -- make a trip to this particular ballyard more something that is to be endured than enjoyed. @Dave: I definitely agree with your perspective on getting out of that ballpark; that's indeed a nightmare. People criticize Dodger Stadium's exit with regard to car traffic (a fair point), but even the foot traffic down the ramps at AT&T Park is claustrophobically unsound. The food choices aren't great (especially on upper levels--with Oakland Coliseum as the competition, I get why there wasn't very much inspiration for greatness), but I do like how they have those beer kiosks on the lower concourse that face the field. And Gordon Biersch amber ain't all bad. As for the sightlines, I haven't had too much of an issue even in the nosebleeds high up. I haven't sat in the bleachers. I don't mind AT&T Park all that much. It's a pretty park, with the views of the bay and all, especially on that rare warm SF afternoon. You've just got to make it out before the seagulls attack. One place that park excels is the diversions for the kids. The playgrounds Dodger Stadium just constructed on the Reserve Level are kinda lame (which is too bad, as the new bobblehead statues are great). If you can get over the fact that there's a huge Coca-Cola bottle in the outfield, the fact that it has a couple of cool slides down it is pretty neat for the kids. Thanks, Sax. You're a stand up guy.